I plan to write an ebook about pruning...in 5 to 10 years. So far, I feel like I've gotten the hang of training and pruning young peaches to the open center system, and this year I'm experimenting with maintenance pruning a mature peach. That's right, after five years of selecting scaffolds and weighing down limbs to get optimal branching angles, our kitchen peach is fully grown. I didn't train her at all this year, just pruned out crossing branches, snipped the tops off watersprouts, and cut back a few branches that had overgrown the path. Our younger peaches needed more TLC. The one above should have gotten a bit more love over the summer since the watersprouts coming up from the rootstock made the main trunk lean. Except for removing the watersprouts, I barely did any cutting, focusing on training my scaffold branches instead. 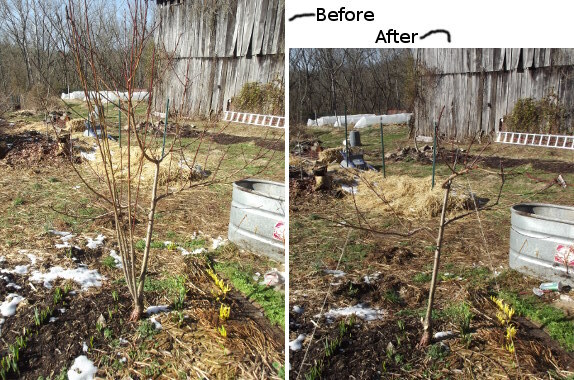 Remember --- the more you can train instead of prune, the fewer watersprouts you'll have next year and the faster your tree will achieve maturity. I'll be pruning and training our apples, pears, and plums tomorrow. Meanwhile, I need to decide what to do with all of the pruned off peach branches. Official sources tell you to burn them to cut back on diseases and pests, but I'm itching to use the organic matter. What do you do with your pruned off branches? Our chicken waterer is the POOP-free solution to filthy traditional waterers. I take prunings into the woods when walking the dog, stab them in the ground, and cut them off above the first bud. Don't know if they'll take, but I have hopes. Eric --- Using them as scionwood is a great suggestion! I've tried to root peach cuttings that way with no luck, but other types of fruit trees might be easier. (I know grapes are.) 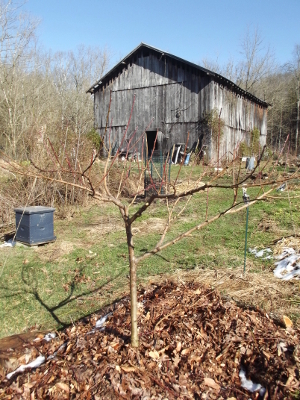 And, if you have rootstock, you can always graft the scionwood on to expand your orchard. Is this the right time of year to be pruning fruit trees? My understanding is that most pruning should be done after the tree is in full leaf. That way, the energy stored in the roots produces the tree's appropriate complementary leaf mass. If you cut now, the energy in the roots produces water shoots. Also, the whole notion of "sanitation" to control fruit tree disease strikes me as not very permaculturish, or at the very least, a lot of bother with dubious results. I let dropped fruit rot where it lays. Here the big problem is coddling moth, two to three life cycles per season. Some years are good, some not so good. I figure the variables are weather, bird activity, soil health, tree mismatched to conditions. But if even only a quarter of the harvest is bug-free, it's still a bountiful harvest. Jackie --- That's a good question. I both winter and summer prune, since each seems to have its place. You're right that summer pruning is best for making the tree focus on fruits for next year rather than lots of watersprouts. 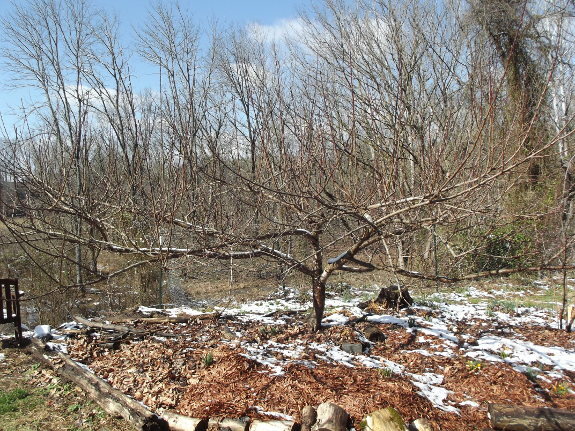 But at the same time, if you don't prune at this time of year, a vigorous peach tree will have so many shading branches that your fruiting limbs won't get enough sun. I try to focus on training at this time of year, though, if I can, for that very reason. I used to agree with you about sanitation, but then diseases started cropping on in my peaches right and left! We lost the whole crop last year to brown rot, which can be spread from year to year from spores on mummified fruits --- those, at least, should definitely be moved away from your tree. I'm not so sure about whether moving pruned branches actually makes any difference, though. By pruning after leaf-out, you still gain air and sun for the remaining fruit. And, the spores causing brown rot are everywhere, all the time. I'm guessing that in your climate, a rain-proof canopy would curb the opportunist; otherwise, I'm betting your peaches are doomed to brown rot forever. I'm not being pessimistic, just hard-headed. You've got a good point --- I was thinking of summer pruning as I've practiced it in the past, where I wait until the fruits are gone so I don't damage them. I haven't tried summer pruning (spring pruning?) earlier when the leaves are newly opened. Is that what you do in your own orchard? What I've read about brown rot is that in certain years, we are just doomed. But that if we keep the canopy open and it doesn't rain quite so constantly, we'll sometimes get fruit. I'm hoping the latter is the case! I used my trimmings to make a raised bed garden. I put some stakes in the ground and laid the branches along. Then filled with dirt and compost. I figure every year I will have trimmings and as the wood dries it compresses and the border of the garden needs filled back up. Kathleen --- That's exactly what I've decided to do with mine! I figure there's a chance some diseases will get back to the peaches, but I'm making new beds quite a distance away in an area that's surrounded by apples instead, so hopefully it won't be a problem. Sorry I don't have references at hand, but from what I recall, one should prune after leaf-out but by the end of June. Winter pruning is reserved for apical cuts and diseased limbs. This timing goes against tradition but makes a heck of a lot more sense to me, and is working out well for my apple trees. Good luck with your peaches, and I trust you'll keep us posted. Jackie --- I've been getting my information from extension service websites (which could be a bit dangerous with new techniques like summer pruning....) All the ones I've read have listed much later times for summer pruning than you give. For example, NMSU says about apples: "summer pruning can be conducted as a once-over operation each year anytime from eight weeks after bloom until mid-August". Other sources list anywhere from the end of July to the end of August as the end of summer pruning, but all the ones I've read say that you're pruning once shoots are 12 to 18 inches long, so you wouldn't be pruning in the spring. That said, who's to say that spring pruning doesn't work! I may have to try some this year and see what I think of it. Yes, you can prune thru the summer. I do mine early because I have to thin the fruit so why let the tree waste energy maturing fruit on a branch that is coming off anyway. My original inspiration for summer pruning I got from a cider press business site that is now defunct (the business owner retired). Basically he advised to keep dormant pruning to a minimum; start after the tree is in full leaf, concentrate on keeping new water sprouts cut back and maintaining the openness of the tree. "Dormant pruning is pruning for (forced) tree growth - summer pruning is pruning for fruit growth. You may cut off branches that have fruit already set, but what's left will be larger and healthier, and the energy not put into growing the branches you've removed can go into setting buds for the following year's fruit." I know you don't like i-net sources of info; I have M. Phillips' The Apple Grower; there's a really good section called "intuitive pruning"; he says of summer pruning "Timing is very critical here: The trees have entered physiological dormancy by the end of July and therefore do not respond with renewed growth. The shoots being thinned out have contributed starch and sugar to terminal bud formation by this point, so taking away these 'excess growing tips' leaves photosynthesis primarily for the fruit-manufacturing end of the tree. [Net photosynthesis remains the same, because sunlight penetration to interior leaves makes up the difference. Only now fruit sizing takes precedence, precisely because additional shoot growth is not induced by midsummer pruning.]" Massive subject, a lifetime to fully master. I really enjoyed The Apple Grower, but I could tell even as I was reading it that I was going to have to come back to it once my trees were more mature. My apples are all babies, so I couldn't entirely grasp everything he was saying. I think you've hit the nail on the head with your quote from the cider business guy --- dormant pruning leads to vegetative growth and summer pruning to fruit. Now that I'm thinking it through with you, that makes me think that with young trees, you'd actually want to dormant prune more, then move over to entirely (or mostly) summer pruning as your trees become mature. As usual, I'll have to keep playing with different things and perfecting my pruning techniques!